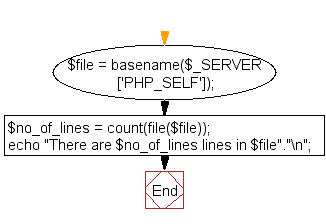 Write a PHP script to count number of lines in a file. Note : Store a text file name into a variable and count the number of lines of text it has. basename() function: The basename(path,suffix) function is used to get the filename from a path. count() function: The count() function is used to count the elements of an array or the properties of an object. Note: For objects, if you have SPL installed, you can hook into count() by implementing interface Countable. The interface has exactly one method, Countable::count(), which returns the return value for the count() function. 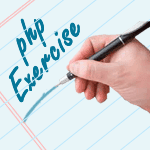 Previous: Write a PHP script to get last modified information of a file. Next: Write a PHP script to print current PHP version.